Like many folks in the west and across Melbourne, I have watched the long-running birth of George Calombaris’s Hellenic Hotel in Williamstown with interest. On a professional level, I have been somewhat ambivalent. On the one hand, this is obviously a significant western suburbs food story, so therefore of great interest to Consider The Sauce and its readers. On the other, Consider The Sauce is used to operating in something of a parallel universe to the bubble that is Melbourne’s officially designated “food scene”. So it would not have surprised me had the opening of Hellenic Hotel come and gone without CTS being involved in any way at all … and that would’ve been fine. But an email from Danielle Poulos changed all that. Danielle is the social media manager for the Calombaris empire. 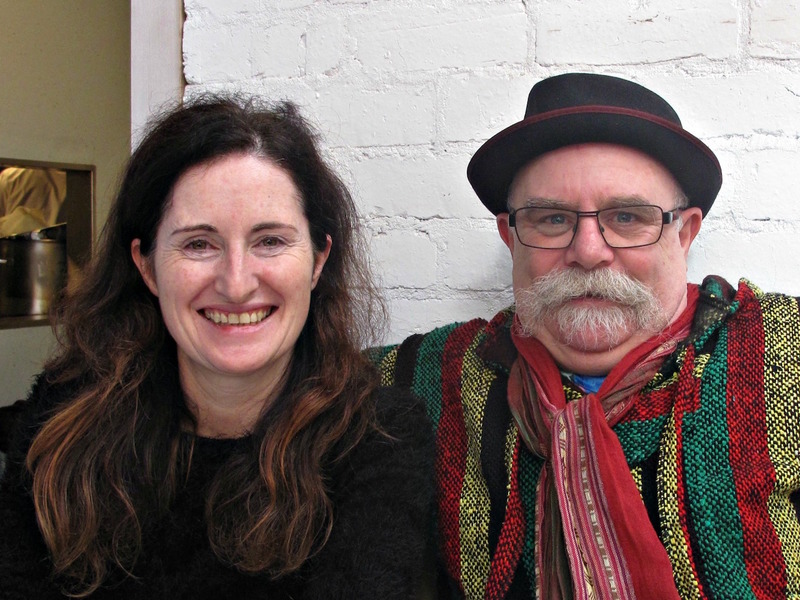 She is also someone with whom I have a previous history – we worked together many times on arts/music stories when I was heavily involved in the Sunday Herald Sun’s entertainment coverage. That all seems a long time ago for one reason – it is! But somehow, we have remained in touch … so I was delighted when her email lobbed and our lives once again overlapped. But my paramount question remained: Did Hellenic Hotel and those who sail in her want to be OF the west – or were they to be merely IN the west but with hearts residing elsewhere? I will continue to take Hellenic Hotel as it comes – but there’s no doubt that having a highly and fondly regarded pal as my point of contact is making a huge difference! 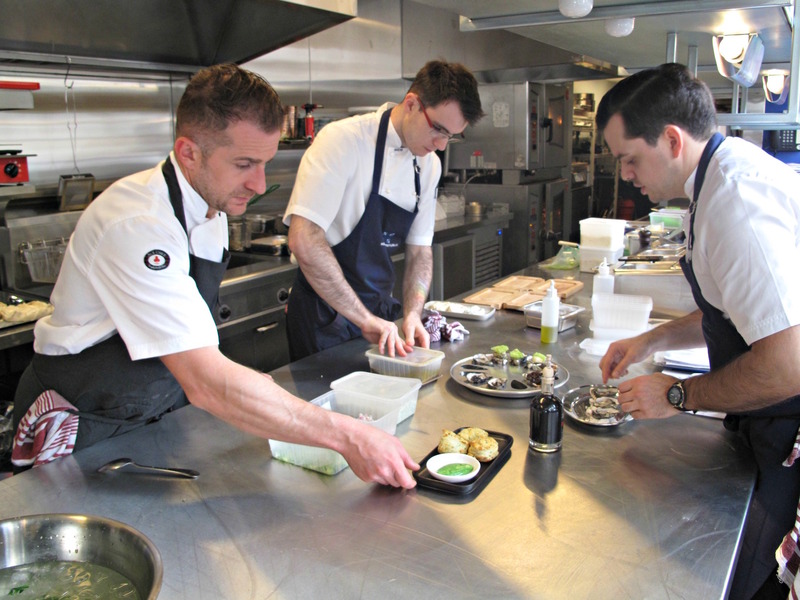 Hellenic Hotel head chef Josh Pelham (right) works with his kitchen crew a week out from opening night. There is about a week to go before Hellenic Hotel opens to the public – opening night, Friday, June 17, is already booked out – and the air of excitement is palpable. 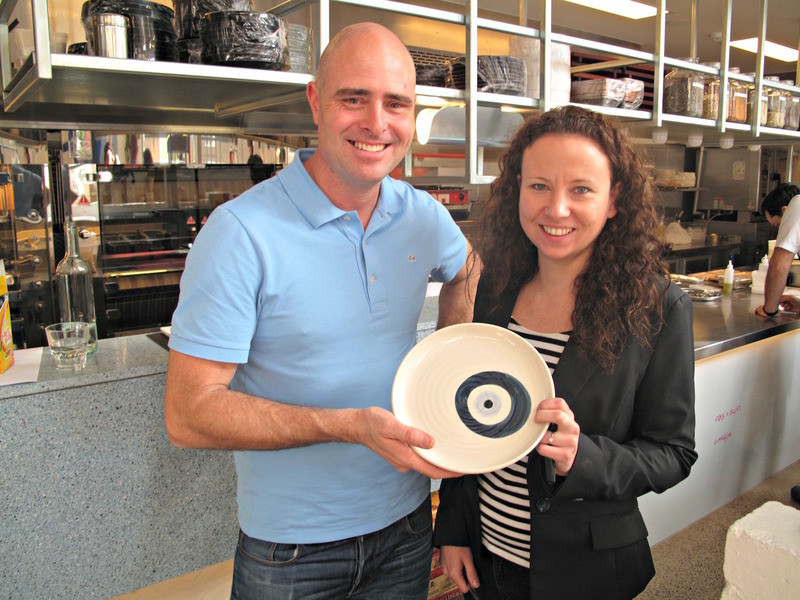 I get a contact high just by hanging out with Travis McAuley (Hellenic restaurants general manager), Nikki Reid (Hellenic Hotel manager) and Danielle Poulos (Calombaris social media manager) as they give me “the tour”. For them and everyone else involved, the pressure is on – but there’s a lot of fun and satisfaction to be had, as well. Travis and Nikki unwrap the new crockery. The Ferguson Street premises is certainly much changed since I last stuck my nose in about four or five months previously. And those changes amount to way more than some new furniture and a pretty paint job (mostly white and blue, as you’d expect). There has been some major infrastructure doings going on here, including installation of a lift and substantial provision of “facilities” and office space upstairs. 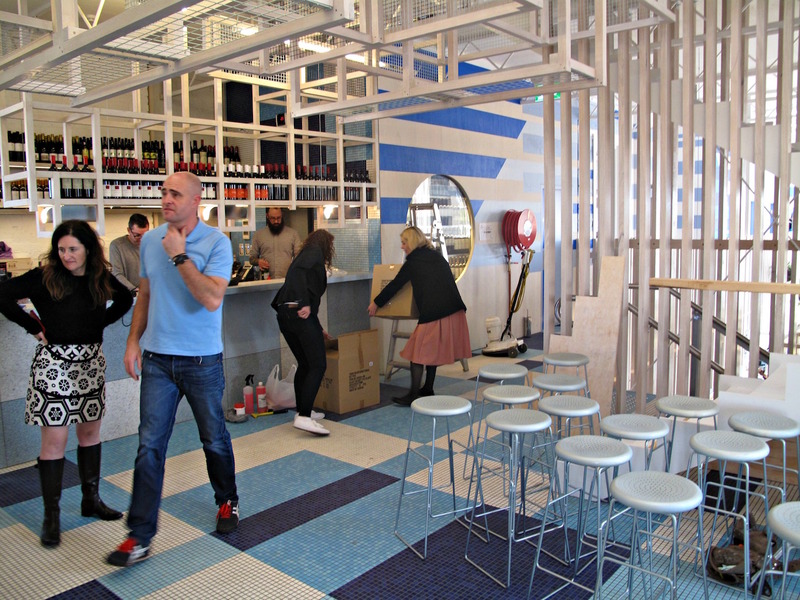 The downstairs area – the dining room of the restaurant proper, which will seat about 100 people – is today buzzing with tradies applying last-minute touches and tying up fit-out loose ends. The place is also buzzing with dozens of newly employed young staff doing training. Ouzo, wine and cocktail training. And training in the Calombaris ethos of “philotimo”, “kefi” and “meraki”. I’m told about three-quarters of the font of house staff of about 25 are locals. Hotel Hellenic head chef Josh Pelham is involved in the training process, as well. He’ll be overseeing a kitchen staff numbering about 12. 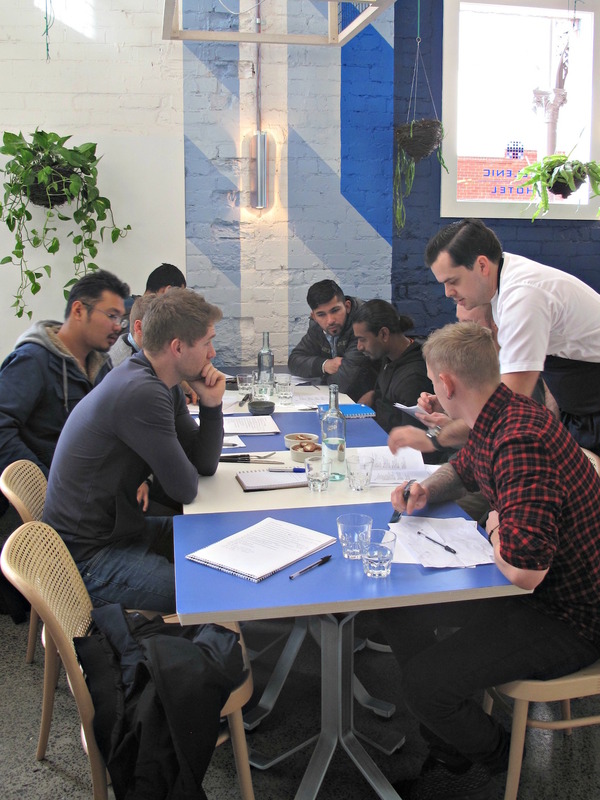 There will be much overlap, menu-wise, with the Hellenic enterprises in Brunswick and Kew – but each of three has its own special focus. In the case of Hellenic Hotel, that will be on food emanating from the kitchen’s rotisserie oven. Upstairs, the bar – seating about 80 people – will sport a more relaxed vibe. The “bar menu” will basically be the starter menu from downstairs, though bar patrons will be free to order from the full list should they wish to do so. 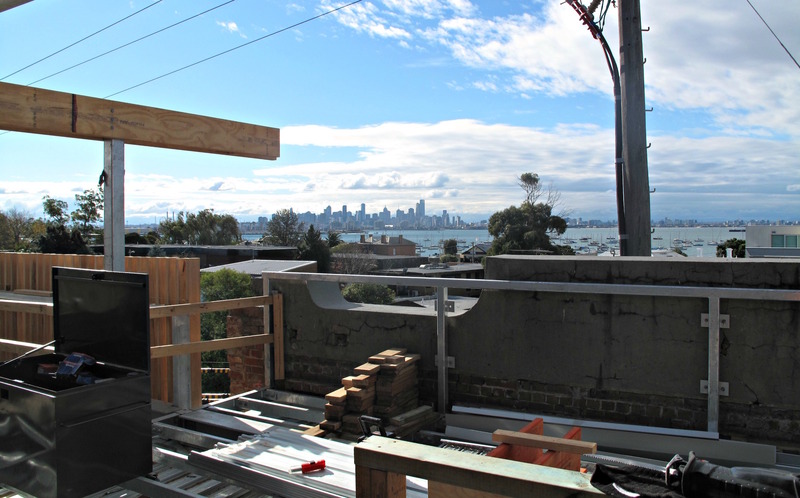 Up here there will also be a $15 daily special – now that sounds good! – as well as Greek-based music on Sunday afternoons. Hotel Hellenic will be open every day from noon. 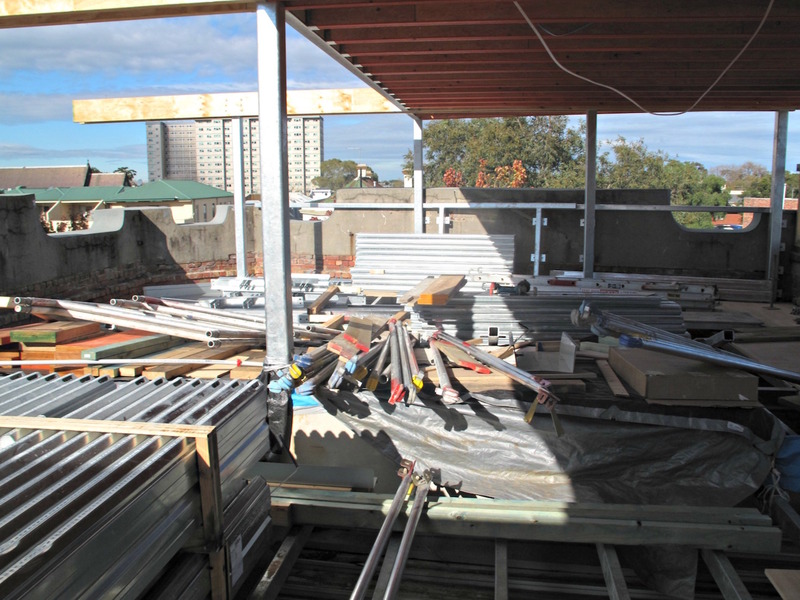 The rooftop bar is very much a work in progress. Travis tells me they’re hoping to have this area up and running come summer. There is, as you’d expect, a high degree of interest. Much of the interest is of the enthusiastic variety – both from people excited about eating in the new venture and from local businesses wishing, hoping for an all-round boost. Some of the interest is passive. And some, a smaller amount, is cynical and even resentful. Again, this is no surprise and is something of which these folks are aware. For what it’s worth, they appear to me to be sincere in their desire to engage with the locals – and win over the unpersuaded. To that end, one of several pre-opening events being held next week has been put aside for them. 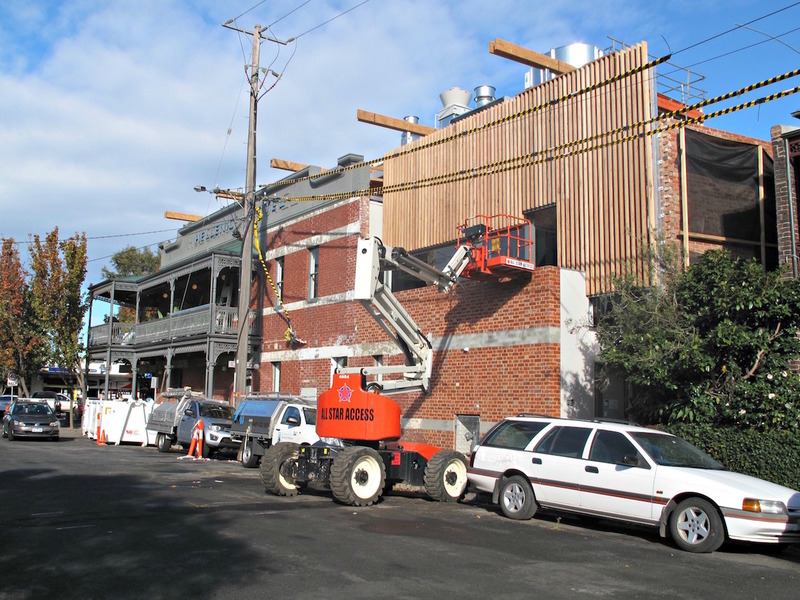 The Hobson’s Bay Hotel has another reincarnation. I used to pull beers there (briefly) as a youngster in the early 70s so I await the new venture with fear and excitement. Excitement first. Anything that will shake up the current charcoal grill joints in Nelson Pl is a good thing. Both Santorini and Remvi are complacent and overpriced, and frankly not up to the standards of the cheapies in Sydney Rd. Also shifting the focus away from Nelson Pl might encourage a few enterprising proprietors to pull stumps and shift. Indeed recently I was chatting with a new kid on the block in Nelson Pl about the opportunity that the Calombaris fit-out presented for a complementary business to open in the immediate environs. He agreed with me but said he was doing good business with both locals and tourists as it is and doesn’t want to open anything bigger. A pity, he has a good concept and serves pretty good food. Now the fear. It’s hard not to be skeptical about a flash joint like Hellenic being able to capture a solid core of locals. 7 Days a week. I can’t see it happening. Unless of course the menu is very price competitive. I say this because the last proprietors of the Hobson’s Bay (whatever that was called) set up an Italian eatery and bar. I went there once for after work drinks and some people stayed on for an early dinner. Being a local, dinner was being prepared at home so I can only report what I saw. One lady ordered a pasta dish that was exquisitely presented on what can best be described as a platter. Problem was that the modest mound of spaghetti didn’t quite cover the area of a teacup saucer. $28. For me, the price of the beer was ridiculous – close to double the price of a beer at nearby Rose of Australia. So it goes. The one remarkable thing about this venture is that it stayed trading for so long – so long after the last customer I ever saw in there during after 6pm trading. So, Ferguson St has a lot going for it, particularly parking for the evening diners. And I suspect the parking will come in handy given my suspicions that the longer term survival of the new venture will depend on customers from nearby suburbs and beyond. As a bit of a segue to this I have watched Squires Loft since opening. I understand it still does good business on weekends despite stratospheric pricing. I have had the odd drink but never eaten there. I just can’t stomach the idea of a slab of steak significantly north of the 300gr that I can cope with. This is a joint that clearly relies on more than just locals. So maybe there is a future case study in over servicing a neighbourhood that still has a large segment of the population still loyal to its pubs and clubs? Hi Pablo! Interesting points. I din’t get a look-see at the menu, but based on the other two Hellenic places, this one will be keenly priced – though I am not sure about portion sizes. BTW, Claude and Antoinetta from Pizza d’Asporto also ran a business in these premises, though before the Italian one you mention, I think. Disagree with you about Santorini – but each to his own! Hobsons Bay and Rosa’s Kitchen! Pablo doesn’t get it, if you wanted to see a massive bowl of cheap pasta you’d have found it elsewhere. Rosa’s handmade pasta on the premises with seasonal only food straight from the farm not stored. Fabulous and yes a bit pricey at the time but such great food. At the time it was a much needed replacement for Lever & Kowalyk, still the best eatery that Williamstown has ever had. Be interesting to see what the ‘new foodies’ serve up! Hi John! We remember Lever & Kowalyk rather well – but perhaps not as fondly as you. Though it was a long time ago! OK, first you say I don’t get it and then you proceed to explain in a roundabout way that I do get it. Yes, I do get it. Economics 101 – a restaurant that has competition is a price taker, not a price maker. That was part of the reason the venture failed. But you didn’t mention the beer. It certainly wasn’t craft beer made on the premises. The mark-up was unjustifiable in light of nearby competition. Have you tried the Rose of Australia, otherwise known as “The Rose”? It might explain why the Rose has been there for a 100 years or more and why some businesses are long gone and perhaps best forgotten….. Went to The Strand Friday night, food was great. Yes it is at the more expensive end of the market, but the food was first class, the service spot on and friendly, nice selection of wines. Not your eat out on a whim kinda place but thankfully it is there for those special evenings, or even better at lunch if you want the views. We had the sardines as an entree, small, but absolutely delicious and could have eaten them all night. It was a treat. By the way if you want great pub food in Willy head to the Stags Head, but don’t tell anyone!